We're in Female Magazine Malaysia! The lass, on the cover of female Magazine Malaysia's February Romance issue, is wearing a bespoke floral headdress crafted by Nook Flowers. The Sochi Olympics flower bouquet symbolises the colours of the host city Sochi. The bright yellow from the solidago symbolises the healing properties of the wealth of the Krasnodar region. Green and white miniature chrysanthemums reflect the meadows and mountains that stretch along the Black Sea. Laurel has always symbolised victory and its presence in the Sochi flowers also goes back to the hospitality and kindness of the people of the Caucasus. The remaining ingredient is eucalyptus. This fragrant ornamental was historically planted in Sochi to help drain the wetlands. Olympic flowers are carefully chosen not just what they symbolise to the host nation but notably also for their hardiness as well as their ability to withstand dehydration and fluctuating temperatures. Women's super-G gold medal winner, Austria's Anna Fenninger smells her flower bouquet during the flower ceremony on the podium at Sochi 2014. Prepping for a Sunday wedding. Classic red rose posies but we've added a touch of vintage glam with the teeny-tiny sequin detailing. It was an exceptional Valentine's Day. Thank you for trusting us with your expressions of love. A big thank you also to all Friends-of-Nook who dropped in to help condition flowers, lift buckets, sweep the floor, take out the bags and bags of clippings and trash, fed the Floristas and told funny stories of love, courtship and happy blunders. You guys made it all the more special. A gorgeous-smelling arrangement in a glass cube with red roses, daisies, eustomas and eucalyptus. The customer who ordered this basket has been with us since our first Valentine's Day at Nook. 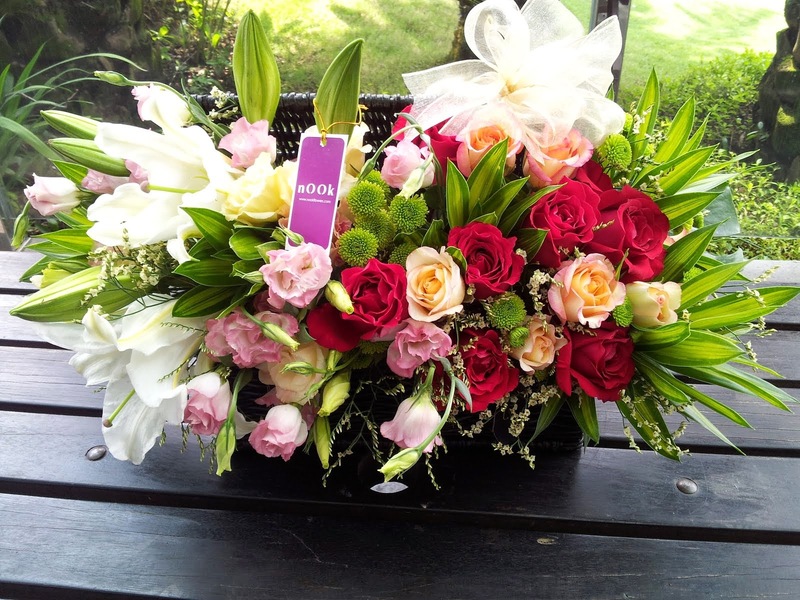 A gentleman who's favourite (and specific) combination is 2 dozen pink roses and 2 white lilies. We have great fun coming up with different interpretations for him. This photo was sent in by another long-term customer. She added a cheeky note saying that her husband was chuffed that he was the first to receive Valentine's Day flowers at his office ... much to the envy of the ladies there. This avant garde piece was specifically crafted for a notable member of the creative arts industry from her adoring husband. It features a two-piece arrangement featuring vase with cymbidium orchids and cypress which is accompanied by a rustic heart-shaped nest studded with classic red roses and eustomas. Close up of the heart-shaped nest featuring red roses and eustomas. Lush arrangement in a lass cube with roses, eustomas and cymbidium orchids dotted with daisies, buttons, peacock and caspia. It's February and we're making the transition from cultural celebrations to celebrations of LOVE! The rose traditionally takes center stage for Valentine's Day, but WE SAY ... give your loved one(s) the flowers that makes them happy whatever that flower may be. Thank you again to Dinesh Aravindhakshan for yet another sublime photo. This image was curated from his 'Heaven Must Be Like This' Collection. Watch this space for our Valentine's Day announcements. Coming soon.